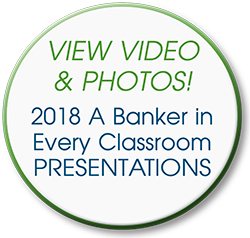 The MBA A Banker in Every Classroom program brings together Mississippi bankers and teachers at the local level to promote financial lieracy for K-12 students. Bankers can present personal finance lessons to students in both public and private school classrooms throughout Mississippi. 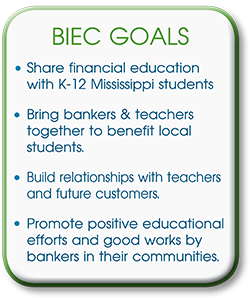 This successful state-wide program has reached over 100,000 Mississippi K-12 students and gives Mississippi bankers the opportunity to do what they do best: build relationships in their communities. Bankers register with the MBA to volunteer to visit a classroom in their area. At the same time, teachers throughout the state register, making requests for local bankers to appear in their classrooms. The MBA then matches bankers and teachers and can help arrange date(s) for presentation(s). Bankers can decide whether to visit more than one school and make more than one presentation. Age-appropriate materials on personal finance topics are available through the MBA, but are not required. Bankers and teachers can decide which materials they prefer to use. Visit our Grade Level Curriculum page on this web site to download materials you may wish to use. Bankers and teachers can decide whether photos are appropriate during the presentation. The MBA will make every effort to publish presentation photos on this web site and in future issues of The Mississippi Banker magazine. Bankers can complete and submit an MBA press release form and the MBA will submit information and photos to local papers on behalf of the banker(s). Additional questions? Please contact Amy Davis, MBA Senior Vice President, adavis@msbankers.com.